Over the past year, I’ve had the privilege of working with École Holt Couture (EHC), school of couture sewing and fashion design. 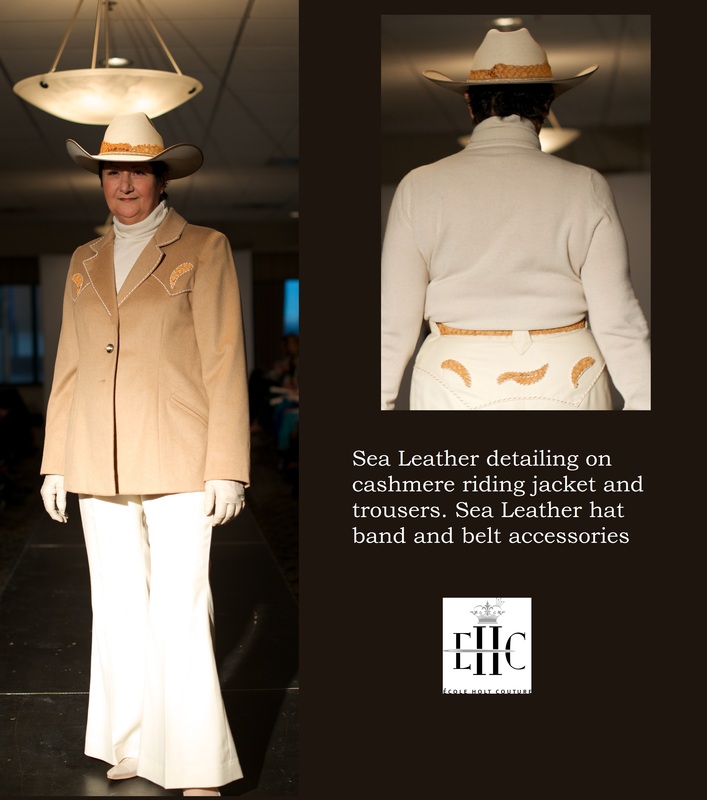 Not just an exceptional client, EHC is doing some exceptional things for fashion in Calgary. As far as the local “scene” goes, the school has undeniably made its mark. And yet, it remains one of our cities best-kept secrets – something I’d like to see change. Not known as a fashion capital exactly, C-town’s industry is most definitely growing. In 2016, I was part of the launch of the Canadian International Fashion Film Festival that chose Calgary as its home. More recently, I was introduced to The Field Group, the city’s first designer coworking studio housed within The Bridge Cowork space downtown (a cool story in and of itself). This, of course, is in addition to everything else “fashion” that has been emerging in our city as of late. Perhaps this is one happy consequence of the local economic downturn, which seems to be galvanizing people to pursue their passions. Or, maybe it’s just indicative of a city that’s reinventing itself, shedding old definitions and claiming its cosmopolitan status. In any case, it’s a shift that I, like many others, am happy to welcome. École Holt Couture launched in 2007. Put simply, it teaches its apprentices the craft of authentic haute couture sewing – the same used by those in the great fashion houses of Europe. It’s the real deal and there’s nothing quite like it in the country. The school’s curriculum, which took 10 years to complete, was created by founder and distinguished couturier Elfriedé Holtkamp and combines her 60 years of experience with classic techniques. A fifth-generation Calgarian, I’m fascinated by how others end up residing here. I’m particularly curious about Elfriedé who is as bona fide a local as I, but who is Romanian born and trained in Europe. I’m not asking questions though; I’m just reveling in the fact that we’re home to someone and something so unique. Although not an aftereffect of the downturn – École Holt Couture’s story originating long ago – I do believe, as our attentions gravitate to new opportunities, it is the school’s time to shine. Not only that, the industry seems right for custom apparel with a market leaning more towards individuality over name brands. Oft associated with the intangible designs donning the high fashion runways of New York and Paris, couture is not as exclusive as many have come to believe. EHC’s couturiers are here and they’re making beautiful, custom garments as we speak. I’m talking about this now because, on November 12th, École Holt Couture will be hosting their annual exhibit and runway event. EHC Showcase 2017 will highlight designs by the school’s graduating couturiers and feature a vintage collection by Elfriedé Holtcamp. This year’s theme is winter-inspired which is appropriate as the season officially turns. I’m as excited about EHC’s upcoming Showcase as I am about the future of school and its role at the forefront, not just of couture, but also of fashion in general in Calgary. For tickets or more info, visit www.ehcfashionshow.myevent.com. As always, much love and respect. At EHC we are very fortunate to have talented students with varied skills. ‘You’re Invited’ was created by one such student, Amy Zia, as a light-hearted look at what we do as couturiers! But, don’t be fooled, what we do is highly professional whether for special occasions or to create a functional and personal business wardrobe. This fashion event is created to help raise awareness and funds for Making Changes Association, who provides hundreds and hundreds of women with functional and appropriate work wardrobes each year. Their clients are all making the effort to re-enter the workforce, and perhaps have few resources to do so. Making Changes programs include guidance on writing resumes, and networking to gain employment, to those who perhaps may never have had to provide these qualifications before. The wardrobes that are provided are all donated, recycled, reused, and up-cycled from high quality garments that are either brand new or gently used, giving the garments a new life as well. More importantly, we support and share their values in how they treat women and teens struggling to improve their life situations, by treating them like family. Almost all of the day to day operations are handled by wonderful volunteers who have time and expertise to share. You are invited, to attend this event! Just click on ‘buy tickets‘, and join us in supporting this wonderful organization. Ecole Holt Couture School will also have a booth at the event if you would like to know more about us, and become part of this wonderful highly skilled, hand-made and crafted market! Enjoy and see you at the event on Sunday November 16th! – cheers J. To get ahead you need to get started. At EHC we are always looking to use 1) natural fibers, 2) environmentally friendly and sustainable fabrics, 3) to recycle, re-purpose and up-cycle already-made garments. And every now and then we come across very interesting new products! We are thrilled with sea fish leather, which is prepared from skins that would otherwise be discarded from commercial fish processing. 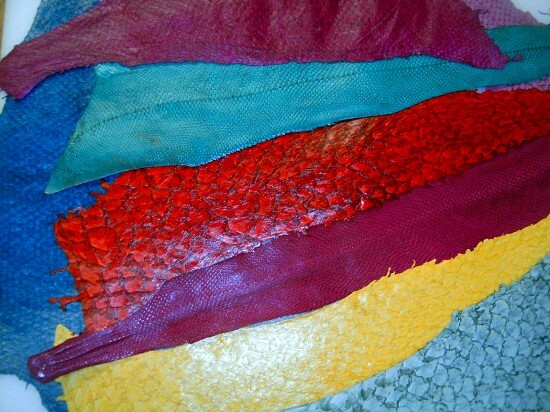 Sea fish leather comes in all manner of surface textures and colors – and NO, it really doesn’t smell of fish at all! Please read the rest of the article: The Reel Truth About Fish Leather! Excited to find Elfriede Holtkamp (EHC’s Founder) contributions to the Greatest Outdoor Show on Earth, the Calgary Stampede, has been published in a new book ‘Calgary’s Stampede Queens’ by Glenbow Museum Librarian and Archivist, Jennifer Hamblin. 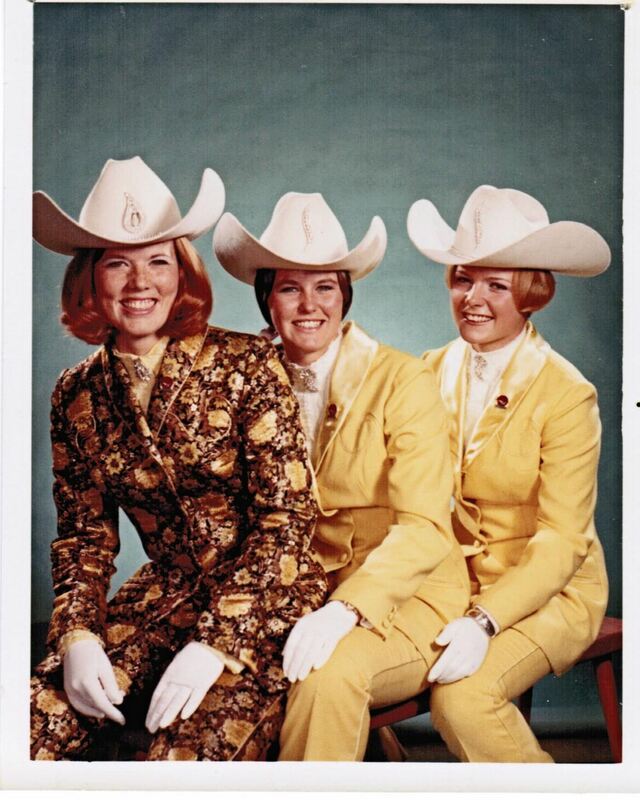 The new book documents the history of Calgary Stampede royalty. Thanks to my husband, Ian Rogan, of the LV Greyes Partnership, who on a research trip came upon the book. Following his instincts and knowing of Elfriede’s involvement with the Calgary Stampede Queen contest, wondered whether she had been referenced in the book. As it turns out, there are a number of photographs as well as a newspaper article from 1968, making reference to the work Elfriede did. Between the years of 1964 and 1973, she created outfits for the Stampede Queen and her Ladies in Waiting (later Princesses). Recalling her association with the Calgary Stampede, Elfriede explains it all began with a serendipitous conversation between her husband, Hermann Holtkamp, and Mr. Jack Gow, a member of the Associated Canadian Travelers (ACT) Stampede Queen committee, whose wife had been designing the Queen’s and her Ladies in Waiting outfits for the past six years. In talking, it was mentioned, that Elfriede was an accomplished seamstress working in Calgary. Shortly after in 1963 Mrs. Orpha Gow, asked if she would consider making the outfits. In preparation, and while awaiting the final outcome of the contest that year, Elfriede took the measurements of all 20 young women! Meanwhile, planning the colours and styles for the Queens and Princesses, finalizing designs and calculating fabric requirements for the Stampede Queen committee to source. By the time the Queen and Princesses were chosen at the end of May, the sumptuous wool fabrics and brocades were supplied and the work could begin. Fittings took place in early June, a particularly rainy month in Calgary. Often travelling was difficult because of the extremely muddy conditions of country roads. Elfriede, recalls working all-night during a particularly heavy thunder storm listening to the late night news announcing concern about possible lighting strikes. At the time, Elfriede’s atelier was staffed with just two seamstresses. With the very short lead time available, many hours of overtime were put in by everyone. 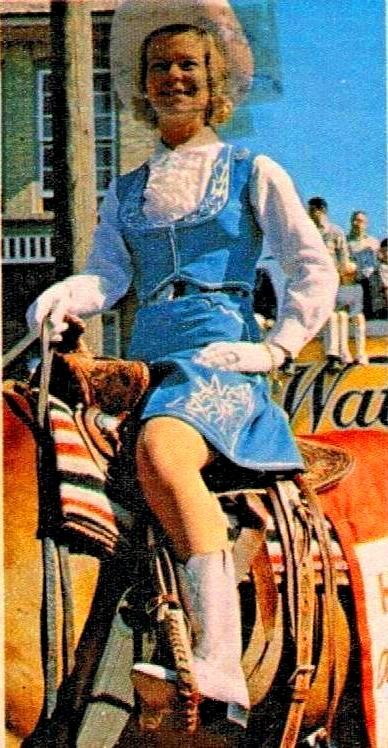 Without the hard work of her employees, six tailored Western style riding suits, fully lined with embellishments, would never have been accomplished for Stampede opening events in early July. 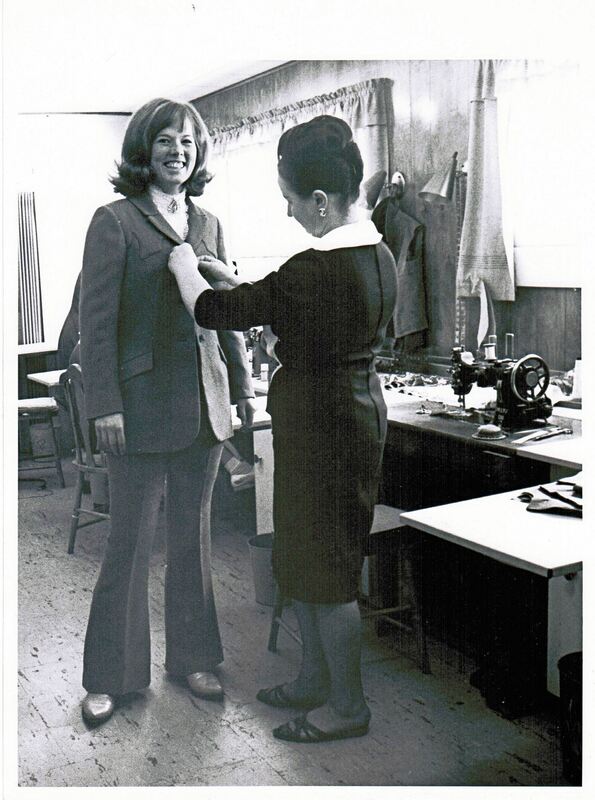 During these years, Elfriede was also asked to create outfits for some honoured guests of the Calgary Stampede including Lady Patricia Brabourne (eldest daughter of Lord Louis Mountbatten) who in 1974, succeeded her cousin Lady Patricia Ramsay, formerly HRH Princess Patricia of Connaught, as Colonel-in-Chief of Princess Patricia’s Canadian Light Infantry (SEE PPCLI BLOG) Katharine Duchess of Kent, first cousin of Queen Elizabeth II, and Norah Willis Michener, wife of Roland Michener, 20th Governor General of Canada. Having opportunity for just a single fitting, measurements for honoured guests were sent in advance. In one instance, measurements supplied were obviously taken or recorded in error. Suspicion they were erroneous were confirmed when Elfriede met the Duchess at a pre Stampede event “and I discreetly reviewed her figure”. For security reasons, fittings for both Lady Brabourne and the Duchess of Kent were held at the Palliser Hotel, where they were staying. On these appointments, Elfriede was chauffeured to and from the hotel and escorted to their suites. Elfriede recalls it being a special time, Lady Patricia Brabourne shared some personal thoughts and a few family photos with her, in particular a recent photograph of her son’s birthday present which was a miniature horse tied with a large bow around its belly. Another year, the Governor General Roland Michener and his wife Norah Willis Michener arrived in Calgary for Stampede via the Royal Train. As the spouse of a Governor General is titled, the Chatelaine of Rideau Hall, the fitting was held in their private carriage. Even with only limited time and one fitting guests of honour remarked on how out beautifully fitted and finished their costumes were. Elfriede with Jennifer Hamblin, Author at Jennifer’s talk and book signing on Tuesday July 29th, 2014 at Central United Church, Calgary.